Raised as a third generation commercial fisherman in Washington Harbor on Isle Royale, Howard worked hard as a young man harvesting trout and herring from the cold waters of Lake Superior. Unfortunately, there is no time or place for a dreamer in the demanding world of commercial fishing. “Quit your dreaming and pay attention,” was the warning Art Sivertson continuously shouted to his son over the drone of the engines. Howard’s visual studies of seagulls, clouds and wave patterns were interrupted just long enough to avoid the entanglement of hook lines, netting or anchor lines. Howard works primarily in watercolor and oils either on location or in his Grand Marais studio. 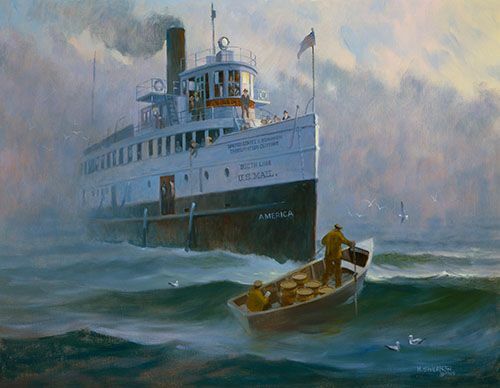 Both a landscape and narrative artist, he paints the scenesand historical tales of the North Shore, Isle Royale, and the Boundary Waters Canoe Area Wilderness.